Ramdane Dris PhD. and S. Mohan Jain PhD. Fresh fruits and vegetables are susceptible to a number of postharvest diseases and disorders. Postharvest operations are predominately aimed at maintaining the harvest quality. The challenge facing industries is to produce food of good quality with few chemical inputs as public concern increases over food safety, environmental issues and chemical resistance. 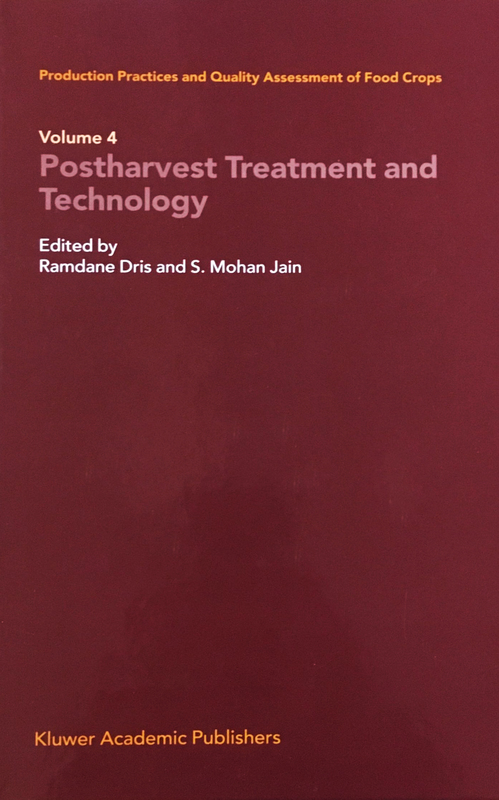 This book has eleven chapters on Application of Sensitive Trace Gas Detectors in Postharvest Research ; Radio Frequency Postharvest Quarantine and Phytosanitary Treatments to Control Insect Pets in Fruits and Nuts; Calcium, Polyamine and Gibberellins Treatments to Improve Postharvest Fruit Quality; lionization of Fruits and Vegetables for Fresh Consumption-Effect on Detoxication Enzymatic System and the Lipid Fraction; Treatment and Techniques to Minimize the Postharvest Losses of Perishable Food Crops; Strategies for the Regulation of Postharvest Fruit Softening by Changing Cell Wall Enzyme Activity; Disinfestations of Fresh Horticultural Commodities by Using Hot Forced Air with Controlled Atmospheres. This book will be especially useful to researchers engaged in postharvest research and graduate and post-graduate students majoring in food sciences and researchers . The hard copy is not available and the soft copy will be available very soon. For further information contact us. Do you want to add this book to cart? WFL Publisher Ltd. PL 48, FI-00981, Helsinki, Finland. Copyright© 2019 WFL Publisher Ltd. All rights reserved.